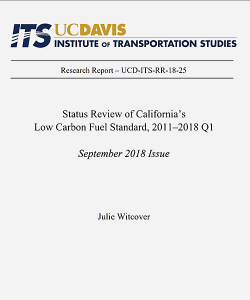 The Low Carbon Fuel Standard (LCFS) was adopted in California in 2009 to contribute to state greenhouse gas (GHG) emission reduction goals under the Global Warming Solutions Act of 2006 (AB 32). Designed as a performance-based regulation, the program incentivizes adoption of low-carbon transportation fuels based on the fuel’s lifecycle GHG emissions per unit of energy—or carbon intensity (CI) as rated by the program. The regulation initially laid out annually declining CI benchmarks for the average transportation fuel mix from 2011 through 2020. In September 2018, CARB adopted regulatory amendments to extend the LCFS for an additional ten years with a target of 20% CI reduction from 2010 levels by 2030. From 2011–2017, the share of alternative fuels in California’s transportation energy grew from 6.1 percent to 8.5 percent. Of alternative fuel energy, the portion coming from non-liquid fuels increased from 7.6 percent to 13.5 percent over the period. Increases in alternative fuel use and declines in carbon intensity (CI) rating came primarily from the diesel pool. Biomass-based diesel—biodiesel and renewable diesel—accounted for 0.4 percent of liquid diesel fuel by volume in 2011 and 15.6 percent in 2018 Q1. Natural gas in transportation grew 111 percent from 2011–2017 to 178.1 gasoline gallon equivalent (gge). Of this natural gas, biogas use was close to nil in 2011 but approximately two-thirds in 2017. Among gasoline substitutes, electricity use grew from less than 0.5 percent of alternative energy in 2011 to 4.5 percent in 2018 Q1. Use of ethanol, the largest renewable fuel by volume, remained close to a “blendwall” of 10 percent blended with gasoline. Prices of LCFS compliance credits (each representing 1 MMT CO2e) fluctuated. Average per credit price increased from $20 to $80 in 2013, ranged between $20 and $30 in 2014 and 2015 under a frozen standard of 1%, rose above $100 in 2016 when the freeze was lifted, and exceeded $160 in summer 2018 as the California Air Resources Board (CARB) was in the process of adopting more stringent targets for 2030. LCFS amendments to be voted on at the September 26-27, 2018, CARB board meeting to take effect in 2019, include: a 2030 target of 20 percent CI reduction below 2010 levels; independent verification and monitoring of fuel pathway CI rating inputs; allowing alternative aviation fuel to generate program credits; a protocol for carbon capture and sequestration credits; credits for lower zero-carbon intensity electricity use; requiring use of a portion of residential electricity credits to fund a statewide point-of-sale incentive program to electric vehicle (EV) buyers if such a program is approved by the California Public Utilities Commission; and introducing capacity credits for EV fast chargers and hydrogen fuel stations. The “capacity credit” provision would permit credit generation untied to current emissions reductions and favor particular fuels (those used in zero emission vehicles, which have no tailpipe emissions) for the first time. LCFS-like programs are in development in Canada (a Clean Fuel Standard to cover transportation, industry, and building sectors) and Brazil (the RenovaBio program focused on renewable liquid fuels and biogas). Neither plans to account for indirect land use change emissions in carbon intensity lifecycle analysis at program outset. Implementation of the Oregon and British Columbia LCFS programs is proceeding.